Posthumous portrait o Christopher Columbus bi Sebastiano del Piombo, 1519. Thare are na kent authentic portraits o Columbus. 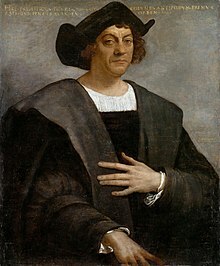 Christopher Columbus (Italian: Cristoforo Colombo;[lower-alpha 1] c. 1451 – 20 Mey 1506) wis an Italian explorer, navigator, coloniser, an ceetizen o the Republic o Genoa. Unner the auspices o the Catholic Monarchs o Spain, he completit fower voyages athort the Atlantic Ocean. Thae voyages an his efforts tae establish permanent settlements on the island o Hispaniola ineetiatit the European colonisation o the New Warld. Wastren imperialism an economic competeetion war emergin amang European kinricks throu the establishment o trade routes an colonies. Columbus proponed tae reach the East Indies bi sailin wastwaird, an this eventually received the support o the Spaingie Crown, which saw a chance tae enter the spice trade wi Asie throu a new wastwaird route. During his first voyage in 1492, he reached the New Warld instead o arrivin at Japan as he haed intendit, laundin on an island in the Bahamas airchipelago that he named "San Salvador". Ower the coorse o three mair voyages, he veesitit the Greater an Lesser Antilles, as well as the Caribbean coast o Venezuela an Central Americae, claimin aw o it for the Croun o Castile. Columbus wisna the first European explorer tae reach the Americas, haein been precedit bi the Viking expedeetion led bi Leif Erikson in the 11t century, but his voyages led tae the first lastin European contact wi the Americas, inauguratin a period o European exploration, conquest, an colonisation that lastit several centuries. Thir voyages haed, tharefore, an enormous impact in the historical development o the modren Western warld. He spearheidit the transatlantic sclave trade an haes been accuised bi several historians o ineetiatin the genocide o the Hispaniola natives. Columbus himsel saw his accomplishments primarily in the licht o spreadin the Christian releegion. Columbus niver admittit that he haed reached a continent previously unkent tae Europeans, rather nor the East Indies for which he haed set coorse. He cried the indwallers o the launds that he veesitit indios (Spaingie for "Indies"). His strained relationship wi the Spaingie croun an its appyntit colonial admeenistrators in Americae led tae his reest an dismissal as govrenor o the settlements on the island o Hispaniola in 1500, an later tae protractit litigation ower the benefits that he an his heirs claimed war awed tae them bi the croun. ↑ "Columbus, Diego. The youngest brother of Christopher Columbus". New Internaitional Encyclopaedia. 1905. — The names Giacomo an Diego are cognates, alang wi James, aw sharin a common origin. See Behind the Name, Mike Campbell, pages Giacomo, Diego, an James. Aw retrieved 2017-02-03. ↑ Chisholm, Hugh, ed. (1911). "Columbus, Christopher". Encyclopædia Britannica. 6 (11th ed.). Cambridge University Press. pp. 741–746. ↑ "Christopher Columbus (Italian explorer)". Encyclopædia Britannica Online. Wikimedia Commons haes media relatit tae Christopher Columbus.